The 2012 Eclipse Awards had yet to be handed out when we went to press, but if you’re reading this after January 19, we’re pretty confident that Shanghai Bobby has won the award for best 2-year-old. All this beautiful dark bay colt did in 2012 was win all five of his races, starting with his maiden and finishing at the prestigious Breeders’ Cup Juvenile. These are outstanding results for any horse, but they’re also very promising for betting on the Kentucky Derby. Each victory was at a progressively longer distance; the Derby is longer still at 1 1/4 miles, or 10 furlongs, so horse players are keenly interested in seeing if Shanghai Bobby can continue this progression. All five victories were on dirt, the same surface he’ll encounter at Churchill Downs. Then there’s the matter of competition. The list of horses Shanghai Bobby has already defeated includes top Derby contenders He’s Had Enough, Goldencents and Bern Identity. Shanghai Bobby has also enjoyed consistent success under jockey Rosie Napravnik; other horses have had to switch jockeys on the Triple Crown trail, some more than once. Shanghai Bobby was foaled on February 27, 2010 at the Stonehaven Steadings farm in Versailles, Ky. This is a relatively new operation, opening its doors in 2008, and Shanghai Bobby is easily the farm’s top success story to date. His sire was one of the best available today in Harlan’s Holiday, who finished seventh at the 2002 Kentucky Derby after winning the Florida Derby and the Bluegrass Stakes. 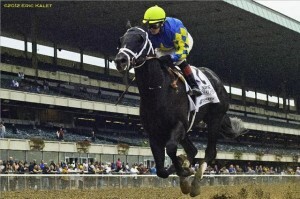 Harlan’s Holiday also sired Denis of Cork, who finished third at the 2008 Kentucky Derby and second at the Belmont. Shanghai Bobby’s mare was Steelin’, one of five broodmares that Stonehaven Steadings purchased in its first year of operations. Steelin’ was already carrying Shanghai Bobby, her first foal, at the time of purchase. Her sire was Orientate, the 2002 Breeders’ Cup Sprint champion. Lexington-based Starlight Racing bought Shanghai Bobby in 2011 for $105,000, and named their new yearling after Bob Burton, a friend who was an airline pilot and often flew to Shanghai. The investment has already paid off in spades; Shanghai Bobby won nearly $1.7 million as a juvenile and is bound to make even more money in 2012. Trainer Todd Pletcher has said that Shanghai Bobby will run in two Kentucky Derby prep races, the same plan that worked in 2010 with Derby winner Super Saver. Because of the new Road to the Kentucky Derby points system, it’s expected those two prep races will be during the second leg of the Championship Series, where winners earn 100 points. The Grade 3 Holy Bull Stakes on January 26 at Gulfstream Park are also a possibility.